I want to talk about comics for a little while. Comics are something that I have only recently got into. I’ve been reading and collecting them for a little over a year now. Ever since I was a kid I have liked superheroes, but for one reason or another I never really got into reading and collecting comics. I have watched nearly every superhero movie since the original X-Men, collected the Mighty Muggs when they were available, and owned plenty of superhero shirts, but I was a little intimidated in how to get into comics. Walk into any comic shop and it’s hard not to be intimidated by the sheer number of comics packed into them. You may want to get into a Batman comic and see that it is on issue #19. How are you supposed to know what is going on in the story line? Also how are you supposed to know which series to start? There are 5 or 6 different Batman or X-Men comics going on at any one time. It’s enough to make you drive away from the comic book shop empty handed and never return. But if you are interested in superheroes, doing so would be a mistake. Comics have many advantages over other forms of media about superheroes. Superhero movies have to assume that the moviegoer doesn’t know much about the character. That is why so many superhero movies are origin stories. They also have to fit everything into a two or two and a half hour time limit. TV shows have more flexibility but are still hampered somewhat. Comics meanwhile can go on for a long time, some even into hundreds of issues. They can also assume that you know something about the characters and therefore expand on them quite a bit. There can also be a lot of crossover with different characters showing up in other character’s books which is really cool and not really possible to the same extent in the movies. Sony Pictures owns the rights to Spider-Man, 20th Century Fox has the X-Men and Fantastic Four, so no Spider-Man or Wolverine in your Avengers movie no matter how cool it would be. (Curse you movie studios!!!) The best advice I could give on how to get into comics is don’t be afraid to ask for advice on which titles are the best and start out small. Nearly every comic book shop I have been in I have found the staff to be very friendly and helpful, much more so that I would have thought. 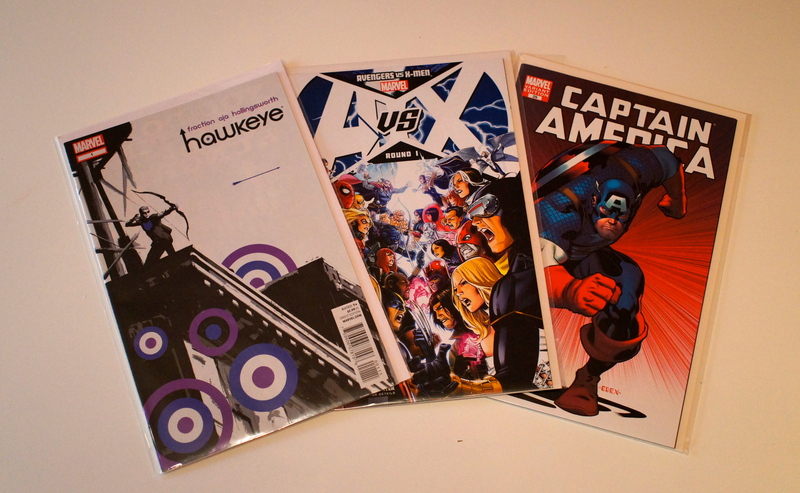 (Especially at my local shop Bankston’s ) I got into comics when the Marvel event Avengers vs. X-Men started last year. It was a 12 issue series that starred a lot of the Marvel characters I liked. It was a perfect entry series for me. From there I gradually picked up other series and am now reading 6 or 7 concurrently. I have started many more but if they don’t grab me, I stop buying them. One great thing about comics is with the sheer variety of them if you are reading a series that you don’t just love, you can just drop it and find another one. You could never hope to read them all so just read the ones you like the best. In just one year comics have become a part of my life and I look forward every Wednesday to what new issues are out. I am going to my first con next month, the Dallas Comic Con, and I couldn’t be more excited. While getting into comics can seem like a daunting task to get into, I assure you it is worth it. I would like to end with a few more tips for those looking to jump in. Free Comic Book Day is May 4th, 2013. Every year you can go to your local comic book shop and get several comic books for absolutely free, a great way to sample different titles. More information can be found here. If you want to get into an older series for a cheap price and don’t particularly care about owning each individual issue, trade paperbacks can be a great choice. Trade paperbacks will collect 5-7 individual comics in a series into one book and at a discounted price. Trade paperbacks are a great way to get up to date on a series you are interested in. If you are afraid of cluttering up your house with comic books and you own an iPad, consider going digital. Download the Comiology app from the app store and buy all of your comics digitally and avoid the clutter! If you however enjoy collecting physical comics as I do, invest in some bags and boards for your comics to protect them and retain their value. Also with Marvel comics specifically, any $3.99 physical comic comes with a free digital comic code that you can use to download the same issue to your iPad. I love this feature! This entry was posted in Comics and tagged comics. Bookmark the permalink. ← What’s In My Bag? Introducing: The Kuribo’s Shoe Podcast!